Originally from Dumfries, in SW Scotland, I now live in Ely, Cambridgeshire, where I have converted my garage into a Studio/Gallery. I am happy to show you around. I have Original Paintings, Limited Edition Prints and Greetings Cards always available. Even if you do not need anything feel free to come and have a look and a chat. Please phone first to make sure I am at home Tel: 01353 772857. Some of my works are available to purchase on line in the SHOP above. For other enquiries please feel free to give me a call. This book gives a potted history of Ely Cathedral as told by Bartholomew the bat and Stephen a Tudor kitchen boy. It can now be purchased on line in the Shop Section above. 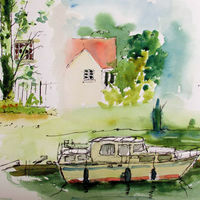 It is written by Maggie Jeffrey and contains many of my sketches and paintings. 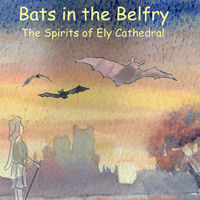 There is a section at the back where you can follow the Bat Trail around Ely and the Cathedral. It is of interest to adults and children alike. There have been a few cool and wet days sketching this year, but it is good to be outside. I can last about an hour and a half before needing a coffee and a scone. I blame the weather but it is the same in the summer. 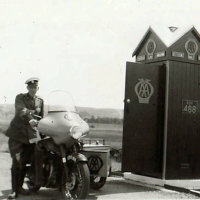 My father worked for many years as an AA Patrol. Some of that time he used a motorcycle and side car. There is a gallery dedicated to him and his motorcycles.